The Sustainable Forestry Initiative® (SFI®) is reporting strong progress on over 400 different research and conservation projects that are helping to improve the shared quality of life in our communities. 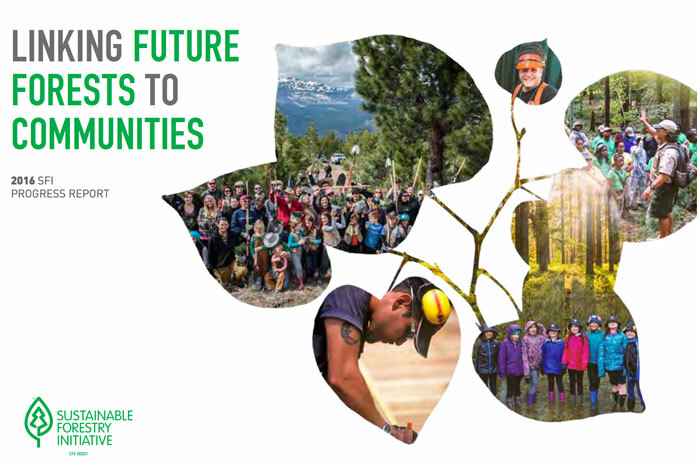 The 2016 SFI Progress Report titled “Linking Future Forests to Communities” outlines how these projects – involving more than 500 partner organizations – are benefiting communities, habitats and multiple species, ranging from woodpeckers and salmon to bears and caribou. The 2016 report is presented in a handy 18-month calendar format. SFI is working toward a future where the global forest community has addressed deforestation and illegal logging and given people a sense of pride in purchasing forest products derived from a responsibly-managed, renewable resource. “The more we appreciate how forests touch each of our lives every day, the more we will make responsible choices on their behalf. Our progress report helps get the message out that people in the SFI community care about forests and are doing great things for future forests,” said Kathy Abusow, president and CEO of SFI. Click here to download a copy of the 2016 SFI Progress Report and to learn more about how well-managed forests store carbon, clean the air we breathe as well as the water we drink, provide habitat for a multitude of species and give us products and jobs that are vital to our economic success.